Leah, who writes the Fashion: Yarn style blog, recently wrote a post as part of a blog hop. She describes it this way: “The idea of a hop is to discover great new blogs. Each of us muses on knitting in response to a few questions and recommends three other blogs they love.” I was very flattered to be recommended. I am normally the last person on earth you want to pull into any kind of chain, or hop, or exchange, etc; for various reasons ranging from busy-ness to laziness, I never respond. But I enjoyed Leah’s post and her very thoughtful responses to the questions, and I certainly read some good blogs, so I will step up to the plate. You can read Leah’s post here. Question One: What am I working on? In my last post, I showed you the yarn for my new project. Pretty, huh? Question Two: How does my work differ from others of its genre? This question is a bit ambiguous: does it refer to my knitting, or my blogging? With respect to the blog, I think that a number of things set this blog apart. First, is that the blog derives its identity and feel in part through the interaction between Emma and myself. For those new to the blog, Emma is my daughter, and knitigating circumstances wouldn’t exist without her. After trying for many years to get me into blogging, she took things into her own hands, set up the blog (I am a technophobe and Luddite), and for the first year, took most of the photos, did all of the style editing, and contributed behind the scenes in many ways. Since she moved away to go to university, the blog is more Kelly-oriented than before, but we still think of the blog as a collaborative entity – I bounce all of my ideas off of her and we are now starting a design collaboration as well. Emma is responsible for the look of the blog, which I try to continue with her high production standards. She is a great writer as well, as shown by this very funny post which Emma wrote on how not to photograph a sweater. 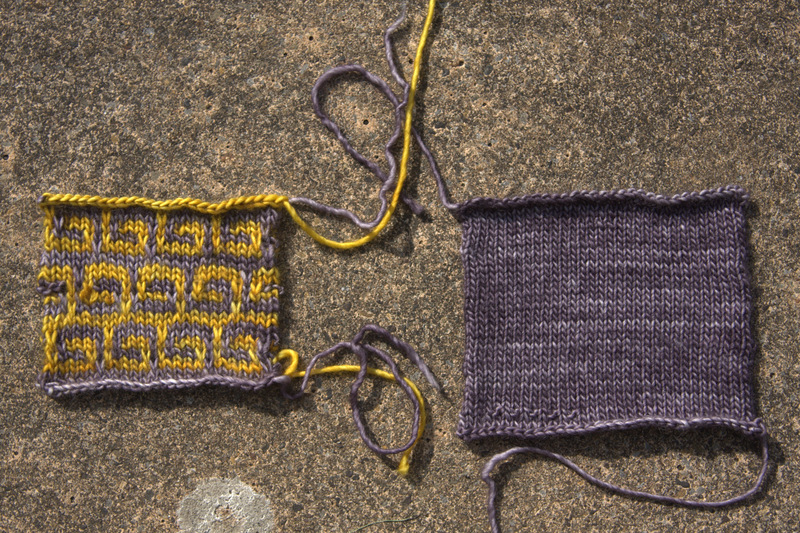 This mother-daughter collaboration behind the scenes makes us different from many knit blogs. I think another thing that defines the blog is that I spend a lot of time thinking about fit and also about style. I knit mostly for myself and my two daughters, Emma and Leah. I am at a stage in life where it is very easy to lose your way through the style jungle. I am getting older, and my shape is changing – the styles that worked for me as a young woman don’t work for me any longer. However, like many people, I have a hard time seeing myself as I really am, and not filtered through my images of my past self. I think that this struggle to find a style that suits me now – that fits with my lifestyle, my shape, and integrates a more realistic body image, is one of the things driving this blog. Interestingly, however, I also knit for Emma and Leah, who as young women are in the process of defining their individual styles. When I knit for them, I work very closely with them to try to knit things that not only suit their body shapes, but suit their personalities and their emerging sense of their own personal styles. Since we are each very different, this search for individual style gives the blog an interesting and dynamic viewpoint which I think sets it apart from many others. As far as my knitting goes, the blog documents my growth as a knitter and the development of new skills. It also picks up on the tension between process and product knitting. I wrote a post some time back about my history as a knitter; it is a post I particularly like and I think it does a good job of describing the different stages in my knitting life – you can find it here. One of the things I talk about in that post is the way in which I was affected by deCuervaine’s tenosynovitis (and subsequent surgery), which led to a long period (over a decade) in which, for all intents and purposes, I could not knit at all. I wrote about how, before the surgery, I had been a process knitter – I knit for speed, and for the process of knitting itself, and wasn’t all that concerned with the output. It was all about the doing. When I was again able to knit, I was slower and I found myself pushed toward the product knitter end of the spectrum. Now that I have demonstrated that I can produce beautiful knitted garments, I am trying to push back again towards balancing process and product. Question Three: Why do I write/create what I do? I cannot remember a time when I was not creating things, mostly involving textiles. From a very early age, I was into embroidery, needlepoint, macrame, weaving, knitting; I was always fiddling around with yarn or fabric. I don’t know why exactly. Partly it’s because I am a creative person and I have an affinity for textiles. I cannot draw or paint and have no musical talent, but put some yarn in my hands and I am happy. I also have always loved to write. I have a PhD in linguistics and work in a neuroscience lab, so I do quite a bit of science writing in my job. I used to want to write fiction but it turns out I have no skill in that arena. Blogging, however, seems to be right up my alley – I enjoy writing about the creative process, occasional travels, design, the knitting process, etc. When Emma was first trying to get me to start blogging, one of my biggest worries was that I would run out of things to say. But that has never been an issue (in fact, I have my next 7 posts worked out in my head – my issues are time-related and never idea-related). Question Four: How does my writing/creative process work? Despite the fact that both knitting and writing seem to come naturally to me, there is still a great deal of time and effort involved. I would rather rip out a sleeve cap and re-knit it six times and get it right, than hurry through it and have it fit badly. Unless you are very rich, standards in clothing have gone way down. The way I see it, if I want a poorly made sweater I can easily buy it; if I am going to put the time and effort into making one, then I should have high standards. This is also why I try to use the best yarn for the project that I can afford – this doesn’t mean always buying boutique hand-dyed yarn, but it does mean knowing who the quality producers are. I have recently started a design collaboration with Emma. I will be blogging about it as we go and hope to address many of the issues, successes and pitfalls we encounter along the way, with special attention to the creative process and how it works. As far as writing the blog, I see many blogs in which the author posts in a stream-of-consciousness way. I can’t do that. I fiddle with nearly every post. I think up ideas for posts constantly, and then I email them to myself, so I have records of ideas as they first pop up. I put some thought into scheduling – which posts would be good now and which would be better later on, which would benefit from more thought or build on other posts, etc. I write each post, and then re-write them and re-write them again, editing many times until I think it’s right. I then usually send the posts to Emma, and wait until she has a chance to read them, and we can have a Skype call about them. She always has good advice and good instincts. Doug also reads nearly every post before it’s published, as does Leah when she’s home. I really value their input. (Leah is an extremely good writer; if she makes a comment, I listen.) Even if everyone likes it and says it’s good to go, I still compulsively re-check it numerous times before I hit the publish button. Perhaps this results from a science background, but more likely stems from some obsessive compulsiveness. If I am going to do it; I want it to be right. I hate reading things that are poorly written and filled with typos (now that I’ve said that, I am sure to come back and find some here). I often mention other blogs in these pages and point out posts or authors that I particularly like. When I was thinking about which blogs to recommend here, I wanted to list ones that I haven’t mentioned before. So here are three blogs I am enjoying reading right now. Check them out; you’ll like them. Yelena, Cheryl and Marjolien (none of whom I have met) – please feel free to respond with a blog hop post of your own, if the idea appeals to you. If it doesn’t appeal, that’s good too. 1. 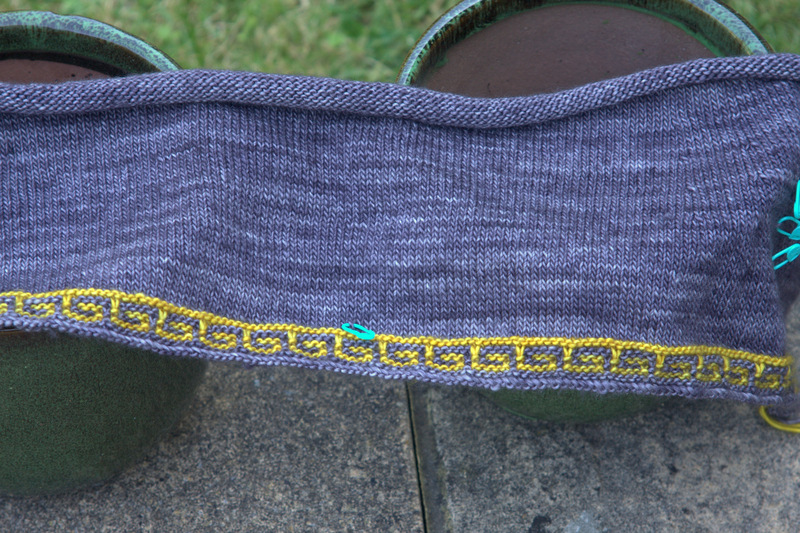 Yelena (ymalcolm on Ravelry) has started a new blog (just last month in fact): le pull juste. Yelena is a gifted and speedy knitter, a very generous commenter and cheerleader on Ravelry, has a great sense of style and an amazing shoe collection. This blog may be new, but it has started with a bang! Even if you don’t knit, you can read it for the shoes alone! 2. I really enjoy reading Cheryl’s blog, Red Knits. Cheryl knits and sews, she swing dances, she is working on a dissertation on the history of readers and book culture, and she writes a really great, newsy, craft-filled adorable blog. What’s not to like? 3. 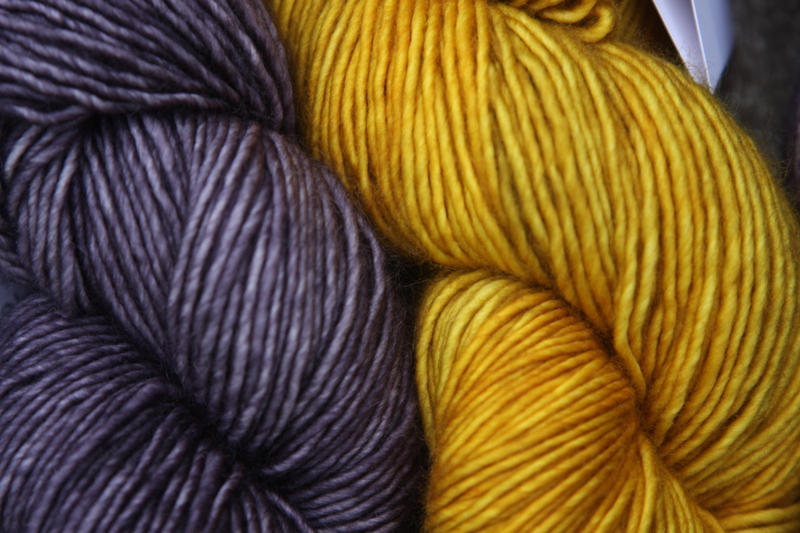 I have recently started reading the blog Kantajour by Ravelry’s marjotse. Like me, she is a scientist and knitter, enjoys knitting for her daughter as well as herself, and knits mostly sweaters; she has also recently branched into designing. She lives in Sweden and I love reading blogs from places I don’t know. Thanks so much for the link! Maybe I’ll do a blog hop post of my own once this long, drawn out move is complete. A beautiful sweater from a beautiful pattern! Love the colour choice you made, it’s perfect! 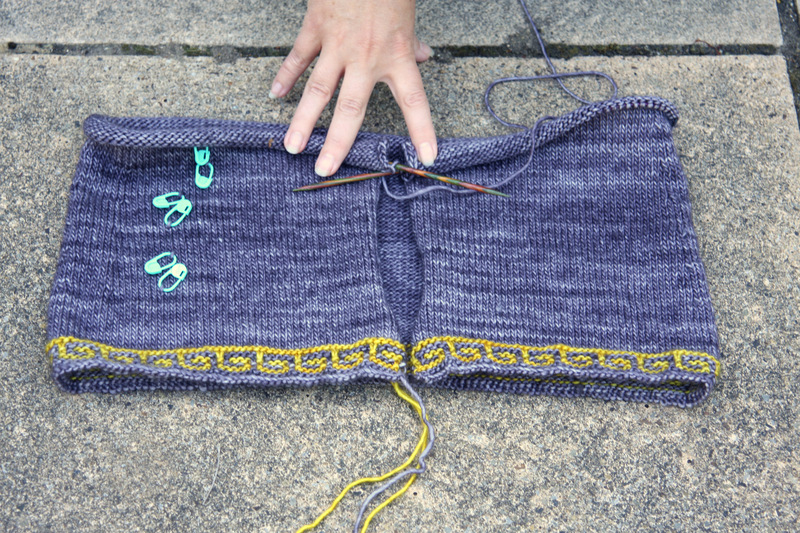 That yoke is going to be so much fun to knit…I’m sure this project is just flying off the needles!